Natural Habitat’s Private Mobile Camp. Photo (c) Stevie Mann. WWF and Natural Habitat Adventures recently teamed up to give away an exclusive conservation safari to Kenya, and we’re thrilled to announce the winners and the details of their adventure! Congratulations to Sherri S. and Evan B., who will be embarking on a custom-designed safari that offers an immersion in East Africa’s iconic landscapes, amid some of the most prolific and diverse wildlife on the continent. Sherri and Evan will spend the week exploring the savannas of Kenya’s Maasai Mara National Reserve via open-air 4×4 vehicles and on foot with a local Maasai guide, and they’ll stay at a private conservancy with exclusive activities that are not available in the national parks, including bush walks and night drives in search of nocturnal wildlife. 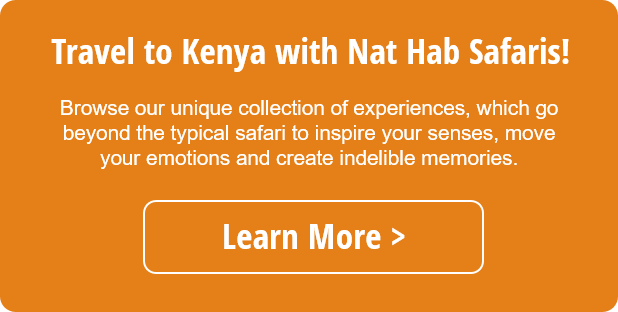 This unique conservation-focused itinerary was designed by Joe Charleson, conservationist and head guide for Natural Habitat Safaris. Joe grew up in Kenya and has been guiding safaris in the secluded and scenic Mara region since the late 1990s. His dream is to see wildlife and sustainable tourism thrive while benefiting the local Maasai people upon whose land his enterprise depends. Increasingly, what makes that possible in Kenya is the conservancy model: a community-run entity enabling the harmonious coexistence of people, livestock and wildlife in their native habitat. Conservancies incentivize communities to protect wildlife and result in more equitable sharing of the economic benefits of tourism. Kenya leads the community-based movement, with some of the original and best-known conservancies such as Lewa and Ol Pejeta, as well as the fastest conservancy growth in Africa. A decade ago, only a few existed. By 2013, Kenya had 130 conservancies, and there are more than 200 now, encompassing more than 10 million acres. The winners of the conservation safari will experience community-based tourism first-hand as they stay at two iconic safari camps (including one that Joe himself developed)—Encounter Mara Camp situated in the Mara Naboisho Conservancy and Natural Habitat’s Private Mobile Camp in the Maasai Mara National Reserve. Below, learn more about each of these camps and how they embody the conservancy model. View from inside a tent at Encounter Mara Camp. Photo (c) Encounter Mara Camp. After flying into Nairobi, the winners will spend two nights at Encounter Mara Camp, situated within the Mara Naboisho Conservancy, a 50,000-acre community-owned tract of land bordering the famous Maasai Mara National Reserve. Protected by a thick acacia forest, Encounter Mara Camp features 10 en suite canvas tents, each with a private veranda and daybed for languid sunrises observing nature at your doorstep. 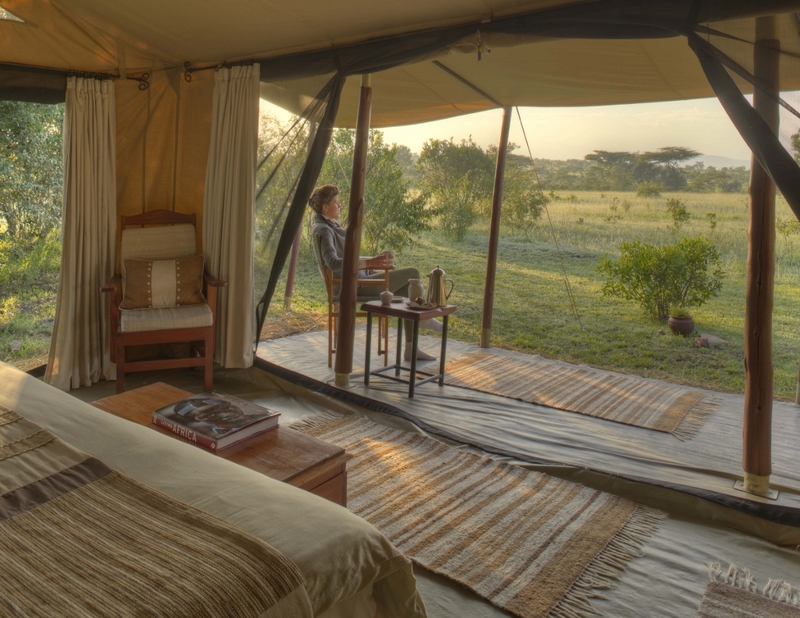 The camp captures the essence of a traditional mobile camp while being securely placed year-round in the lion-rich and wildlife-dense private Mara Naboisho Conservancy at the edge of Maasai Mara National Reserve. While you can view animals traipsing past your camp, the real action happens on early morning and late afternoon wildlife drives within the vast conservancy, reserved to only guests of local accommodations, of which there are very few. The intimate nature of this wilderness area comes to life on guide nature walks and twilight wildlife drives seeking nocturnal animals as well. Mara Naboisho showcases an incredible density of lion as well as local plains wildlife—zebra, giraffe, wildebeest, elephant, cheetah, hyena, and more! Game drive from Natural Habitat’s Private Mobile Camp. Photo (c) Dain Lewis. After Encounter Mara Camp, the winners move on to Natural Habitat’s Private Mobile Camp, Maasai Mara. To experience the Great Migration as the herds thunder across the Maasai Mara is among the world’s most amazing wildlife encounters. To experience it far from tourist crowds takes it to a whole different level. That’s what Natural Habitat’s Private Mobile Camp, Maasai Mara makes possible. 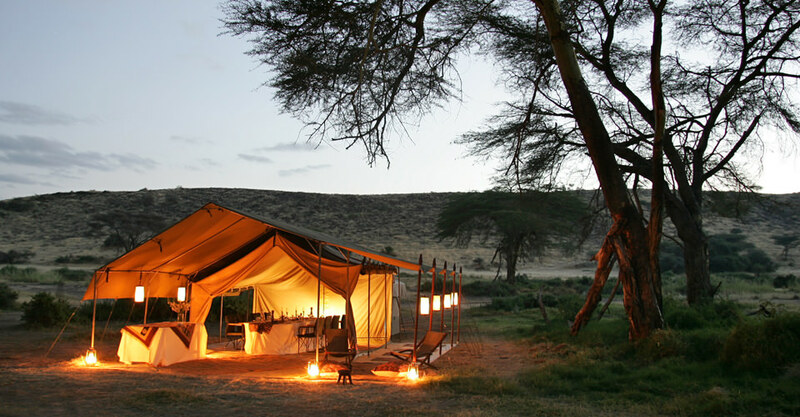 We place the mobile camp in the best wildlife-viewing areas, where seclusion amid raw nature prevails. Inside the deluxe tents, however, you’ll find full beds with quality bedding and attached en suite bathrooms—surprising comfort and privacy—and your own veranda with director’s chairs out front, shaded beneath a canvas awning. The Maasai Mara National Reserve, in the northern part of Kenya and Tanzania’s vast Serengeti ecosystem, is home to nearly 100 species of mammals and 570 recorded bird species, making wildlife viewing here impressive at any time of year. The Great Migration, of course, is incomparable, when nearly two million wildebeest, zebra and Thomson’s gazelle move in long, flowing columns across the plains toward the new grass that comes with the rains. There is also a chance to see the classic Big Five—elephant, rhino, buffalo, lion and leopard. Cheetah, giraffe and varied antelope are also common sights. WWF and its partners on the ground in Kenya have worked together for years to protect the country’s elephants, rhinos, lions, and other wildlife by fighting illegal wildlife trade, minimizing human-wildlife conflict, and protecting their habitat. We’re excited to be able to share this incredible country, its captivating wildlife and its diverse landscapes with our Safari Sweepstakes winners! Congratulations again, Sherri and Evan—we know you’re going to have a fantastic trip! are sharing? A dream for most! Beautiful I would love to visit there.